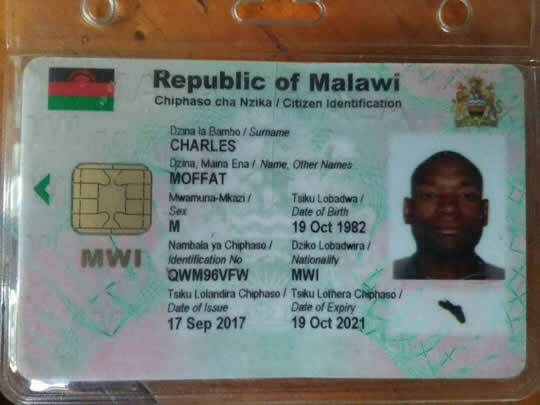 The first grade magistrate court in Mchinji has sentenced a 36 year old Moffat Charles Msuza to pay K100,000.00 fine for being found in possession of two Malawian national identity cards bearing similar details. The court heard that Msuza who also has a Mozambican national identity card admitted to have registered twice from different registration centres. He told the court that he registered at Tamanimwenda Village in Mchinji and Chiwudzu in Lilongwe during the past national registration exercise which was being conducted by National Registration Bureau (NRB). The state through the Station Prosecutions Officer, Davie Kusamale told the court that Msuza (36) was arrested on July 3, 2018 by police officers from Namizana Border Patrol Post when he wanted to use a shortcut crossing the border post to the main road not knowing that he was trespassing the camp. When he was interrogated by the police, Msuza claimed that he was coming from Ngongani Village in the area of Traditional Authority Mavwere in Mchinji, where he usually does his zitenje business while operating from Lilongwe. The police prosecutor said in the course of investigations he was found with three national identity cards: one for Mozambique and two for Malawi but bearing similar details but he did not disclose his motive behind acquiring the two IDs. In court, Msuza pleaded guilty to the charge before First Grade Magistrate, Arthur Mtalimanja who found him guilty of being found in possession of two national Identity Cards contrary to section 42 (h) of National Registration Act of 2010. Mtalimanja ordered Msuza to pay K100,000.00 fine or in default serve 12 months Imprisonment with Hard Labour(IHL). Msuza (36) hails from Chiwudzu village in the area of Traditional Authority Kalolo in Lilongwe. Meanwhile the said National Identity cards have been handed over to National Registration Bureau through Mchinji district council for further disposal.